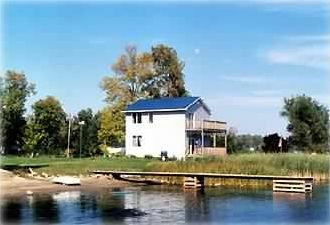 Waterfront 4 Bdrm, Gallop Canal/Thousand Islands; kayaking; NEW HOT TUB. Get away and enjoy the peaceful countryside. Located on a historic route, 15 minutes to Brockville along the St. Lawrence River. Built in 1999 this house provides modern conveniences with old-time charm. Waterfront property with beautiful scenery and wildlife. Fully furnished with hardwood floors and a dock for swimming and canoeing. The area offers a variety of activities for all ages: historic sites, museums, antique shopping, local summer and winter festivals, water sports (renowned fresh water scuba driving both for shore diving and river dives), and golf. We have Kayaks, canoes and volleyball onsite. Randy and I have lived in the area for almost 20 years, both natives of Quebec so we do speak French. We ended up in this area when I moved for work and Randy followed. Randy currently works as a realtor in the area and I work full time as a consultant. Having grown up in Quebec city and travelled along the Eastern Seaboard of Canada and the US this area offer the beauty of comfort and things to do. Comfort of the home to enjoy meals together with family or friends, a quiet coffee looking out on the river, space for a soccer or volleyball challenge or a peaceful paddle in the kayak. Activities are numerous particularly in the summer just drive North, South, East or West and you will find fun for the family or friends. We border on the US so if heading South to explore Ogdensburg, Canton, Alexandria Bay NY bring your passport. Having been renters of other cottages we work hard to make sure that the cottages are well kept and not to dissapoint and that the price is affordable. This cottage has a double level deck that overlooks the water with breathtaking views of the St. Lawrence at any time of year. At the end of your rental please leave the sheets on the beds. At the end of the drive and additional parking off the main road. Bath towels for inside use for the number of guests only. dining area cozy but table can be extended. Some sleds available in the shed during the winter months. Beachcomber hot tub. Unfortunately had to winterize it for this winter 2019 due to electrical issue. will be operational as of end of April. This home lends well to family vacations, groups of friends and couple weekends. Just ask if you are looking something specific in the area to do we can give you more information as to what is available. Lots of local activities in the summer months; Upper Canada Village, Fort Wellingston, Live theatre St. Lawrence Shakespear festival, Upper Canada playhouse.